Alkmaar is located in the province of Noord Holland (North Holland) and has about 100,000 inhabitants. The city of Alkmaar is first mentioned in 10th century documents, and was granted city rights in 1254. The city has an old city centre with small streets, bridges and canals. Alkmaar still contains many quaint houses of the 17th century, and is renowned in the history of the Dutch struggle for independence for its stout and successful resistance to the besieging Spaniards in 1573. On the 8th of October 1573 the town regained its freedom from the Spanish occupation, this day is still remembered by its inhabitants with festivities. In the Lange Straat, the chief street of the town, rises the Stadhuis with its tower, a late-Gothic structure dating from 1507. The Weigh House (reached from the end of the Lange Straat) was formed in 1582 out of the former church of the Holy Ghost. 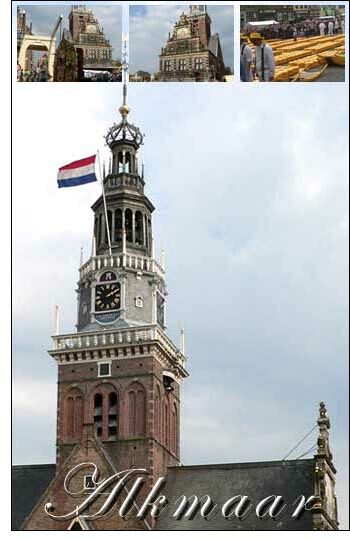 The handsome tower (with chimes and moving fgures) was completed in 1599 by Cornelis P. Kunst. Alkmaar is the centre of the cheese trade in the Netherlands. On market days the whole of the picturesque place in the front of the Weigh House is covered by huge piles of red and yellow Edam and Gouda cheeses. It is not actually possible to buy cheese at the cheese market itself, which is really only a demonstration of how this merchants' market operated in the older days. However, the show, which takes place in front of the medieval weighing house, is surrounded by many stalls where you can buy all kinds of cheese (and non-cheese) related products. The Grote Kerk (meaning Big Church in Dutch) or Saint Laurens Kerk (Saint Lawrence Church), a fine late-Gothic cruciform edifice (1470-1498) deserves a visit.